Sunday's police violence came on the heels of a peaceful anti-NATO march designed to draw attention to NATO's role as the military arm of global elites -- and to the enormous destruction that NATO military action brings to the people whose countries it bombs and occupies. At the terminus of Sunday's march, which authorities refused to allow within site and sound of the NATO summit, 45 military veterans of Afghanistan and Iraq condemned U.S. military policy and threw their medals in the direction of the NATO gathering, in a refutation of NATO's actions in Afghanistan, Pakistan and beyond. "I was in Iraq in '03 and what I saw there crushed me," said veteran Ash Wilson. "I don't want to suffer this again, and I don't want our children to suffer this again." Wilson then hurled his medals towards McCormack Place, shouting "So I'm giving these back!" Protesters had kicked off the weekend of protests with a vigil and event to support Palestinian political prisoners -- Israel is a partner nation with NATO -- and actions oppose home foreclosures and dispossession and the Obama administration's immigration and deportation policies. Housing advocates argue that the U.S. government has spent hundreds of billions of dollars bailing out big banks and trillions bankrolling the U.S. war machine, while homeowners suffering in the wake of the worst economic crisis are being thrown out of their homes by Wall Street. Immigrant rights activists charge the Obama administration with stepping up a policy of departation of the undocumented, particularly Latinos, who are driven out of their home countries by the same kind of economic violence and displacement that military invasions and occupations typically create in countries targeted by NATO and U.S. military actions. This week's actions have been supported by projects that range from Seeds of Peace to National Nurses United, which helped bankroll buses from across the country to the NATO summit and staged a rally on Friday to demand that Wall Street pay its fair share of taxes. Saturday, protesters gathered near Chicago mayor Rahm Emanuel's house to stage a 'Health Care Not Warfare' action to decry the privatization and closure of Chicago public health clinics in a local wave of austerity measures that mirror the constriction of public services nationwide -- a reflection of national budget priorities that direct more than half the nation's budget to the military instead of human needs at home. 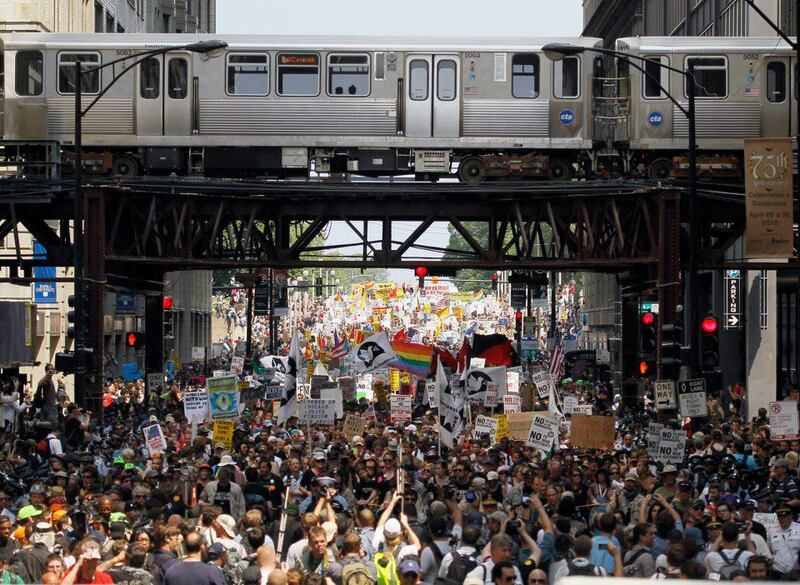 On Sunday, after IVAW members tossed their medals in the direction of the NATO summit, police moved swiftly to push people away from their rally site at Michigan and Wabash, with many protesters kettled north of Cermak and west of the east side of Wabash, and hundreds unclear on how to -- or unable to -- exit. Many of those kettled protesters watched in horror as the police unleashed a wave of clubbing on protesters near the front of the line, leaving the area between the two kettled groups of protesters littered with empty plastic water bottles and the shoes and hats of more than 40 protesters who were dragged out of the crowd, beaten and arrested. National Lawyers Guild attorneys reported on Monday that the majority of those arrested at the scene have been released, putting the lie to the police assertion that only violent protesters were taken into custody. Sunday's police violence after the vets' action came on the heels of a series of police assaults on boisterous but non-violent Occupy protesters on Saturday as they wound their way through the city in a series of converging actions. The police attacks on local Occupy organizers in recent days represent the first time the police have overtly targeted the local movement with brutality. Protesters also reported a number of undercover officers in the Sunday march who were apparently inciting some protesters to violence. Protesters say that pattern of police infiltration and incitement continued into Sunday night. Police also arrested five activists in the run-up to Sunday's march on terrorism charges -- with Truthout reporting that all five are linked by the word of two police informants, “Mo” and “Gloves,” in what increasingly is being viewed as cases of entrapment in which the informants' allegations provide the only 'evidence' of wrongdoing. Meanwhile, protests are scheduled to continue this week, with actions opposing austerity and union-busting in the public schools, hunger and militarism. Chicago Indymedia has been cooperating with livestreamers, photographers and independent media makers from around the nation to provide coverage of this month's protests, through our livestream channel, our special NATO information site, our facebook pages for NATO Indymedia and Chicago Indymedia, our NATO Indymedia youtube channel, and our twitter feeds @natoindymeda and @chicagoimc.